Network executives at CBS expressed say they hope that Katie Couric's move from the NBC Today Show to CBS Evening News as the first woman news anchor in the universe will give the public a more positive image of reports of genocide and mosque bombings. Suffering from Dan Rather's overly serious face during reports of murder, mayhem and destruction, Americans have been eager to turn to a more forgiving, optimistic and feminine face to reveal the daily body count. CBS is banking heavily on Couric. "We were thinking about getting Jessica Simpson, or Christina Applegate to replace the chiseled, hoary Dan Rather," said CBS President Robert C. Wright, "because it's important that Americans feel good about themselves when they are told that Washington has just been the victim of the first nuclear attack on American soil, which is bound to happen." Wright stated that CBS was most concerned about renewing the viewers' faith in honest reporting, "and what better way to re-establish trust than that 'So The World's Burning, Let's Jump In The Sack One Last Time' look?" "Wait, female news anchor?" said a confused Will Ferrell. "Didn't this already happen?" The world will be watching as Couric takes over for Dan Rather, whose bland commentary and drone elucidation of the daily news comforted generations during their TV dinners. The true test will be Couric's effectiveness in soothing a bruised nation when the next terrorist attack strikes, something that Rather performed so adroitly when terrorists flew airplanes into the Twin Towers on 9/11/01. "I remember watching Dan Rather that afternoon [of September 11, 2001], and thinking, 'Thank God it's him giving me my news, and not some bimbo who will start bawling at the first sight of someone falling 60 stories to their death," said nightly CBS watcher Kelly Walters, work-at-home mother of two. "That voice of reassurance was the avuncular Rather, but now the torch has been passed to Ms. Couric, who had better work on turning that smile of hers upside-down...but not too much." "I will most likely have a heart attack when I see that woman and her short sleeves," added 86 year-old Samson Varney, a typical CBS viewer. Others have offered a different point of view. Neighbor and friend of Walters, Jackie Summers, hopes that Couric is the breath of fresh air that the evening news needs. 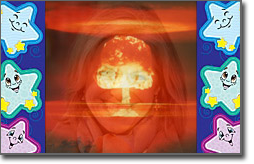 "Katie Couric might be good at making me feel satisfied about being a stay-at-home Mom [on the 'Today' show]," said Summers, "but as for giving me that same sunny feeling when American soldiers and Iraqi civilians are detonated in the latest bombing, I'm reticent." "But I'm really pulling for her," Summers added. "Girl power, yay!" Liberals are pulling in their own fashion, hoping that they will find in Couric a kindred spirit to Walter Cronkite and Dan Rather, who will assure them that every war that America fights is unwinnable. Conservatives have already lashed out against Couric's happy-go-lucky persona, claiming that the news must be delivered with the utmost gravity so that the alleged liberal bias will be taken seriously when conservatives gather for dinner or bowling to complain about the media. "What if it were Couricgate and not Rathergate?" rhetorically asked Dale Marshal of Dover, PA, in reference to the falsified reports that Dan Rather read over the evening news during the 2004 Presidential campaign stating that Bush was documented as having gone AWOL during national guard service. "Everyone would have put it up to just another dumb blond making another dumb blond mistake, but with Rather's intense seriousness and believability, my buddies and I had a field day at the VFW about America's liberal bias in the media. How can we do that when it's a woman giving us the news, who we know is going to say stupid things? This ruins the credibility of our arguments that the media lacks credibility." Executives are hoping that Couric will entice a younger generation into paying attention to the evening news, and not the independent blogs and small-time news outlets that offer alternative journalistic viewpoints on the Internet. "This new wave of quality journalism from limitless sources throughout the World Wide Web has eroded the blind faith that the common American has in their nightly news," said an NBC spokesperson. "Whether or not Ms. Couric has the 'gravitas' that everyone's talking about has yet to be seen, but one thing she does have are ta-tas – or should I say TWO things that she has – and if that's not credibility, then I don't know what is." Couric was unavailable for comment, but her agent assured reporters that she would report the daily news with restive integrity, and that she has promised not to cry when it's time for the infant mortality rate of the Sudan to be read.